Opening hours: Shops normally open from 9am to 1pm and 3pm to 7pm on weekdays, however many shops no longer close for lunch. 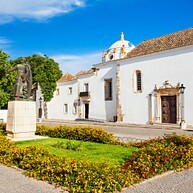 The capital of Algarve is one the most typically Portuguese cities in the country. In Faro you have the chance to enjoy an amazing marina, cobblestone squares and green parks, as well as an old town sprinkled with cosy cafés and tiny traditional restaurants. But Faro can also be discovered by night, thanks to its massive student population that lights up every bar and plaza of the city, not to mention all the cultural activities you will be able to enjoy, including theatres, art exhibitions, majestic churches and historic monuments. Last but not least, do not miss the natural beauty of the Parque Natural da Ria Formosa and the numerous islands scattered a few kilometres from Faro's pristine beaches. Museu Municipal, also called Museu Arqueológico, contains mainly archaeological finds. Located in the former Nossa Senhora da Assunção monastery inside the ring-wall, the gardens date from 1540 with beautiful, two-storey cloisters which form the heart of the museum. Among the most remarkable items is a Roman floor mosaic from the 4th-century with the head of the Roman god Neptune in exquisite detail. 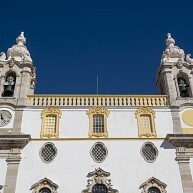 From the outside, Faro’s cathedral is low and squat, a mixture of Renaissance and Baroque as a result of protracted renovations and additions following the devastation of war and natural catastrophes. The interior is equally mixed but with interesting features, including a large organ from the 18th-century with Chinoiserie decoration. Igreja do Carmo is the most popular of Faro's churches, but not so much for its fantastically overly-elaborate, gold-leaf laden, Baroque interior as for its Capela dos Ossos - “bone chapel”, which was added in 1816, and is entirely decorated with the skeletons of monks. The Ria Formosa wetlands area was declared a protected natural area in 1987 because of its unique conditions as a breeding place for wetland birds being threatened by the expansion of tourism. This way, the entire coast from Faro to Cacela Velha was able to avoid exploitation. 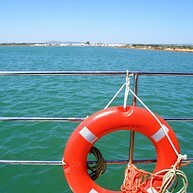 A boat trip to one of Faro’s islands is perhaps the best way to visit Ria Formosa. 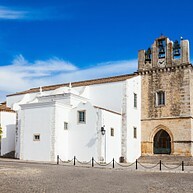 The Palácio de Estoi, unique in Algarve, is situated in the town of Estoi, just north of Faro. It is a private palace built in the Rococo style during the second half of the 19th-century. This miniature version of the King’s palace in Queluz, outside Lisbon, is surrounded by very beautiful gardens that are open to the public. In Milreu – just outside Estoi – are the Algarve’s chief Roman remains. There are many reasons to visit Faro, but one of the city's biggest draws is the prolific diving scene. Whether it is your first time diving or you have been doing it for years, the numerous diving schools, such as Hidroespaço, will suit your needs and provide everything you need. At Deserta Island you have the opportunity to spend a day on a deserted island and enjoy the white sand and crystal blue water. Arrive either by boat or water taxi and do not forget to bring water, since it is very hot under the sun. As there is only one restaurant on the island, it is a good idea to bring a snack, as well. 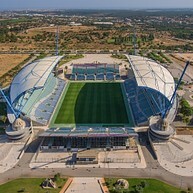 Estádio Algarve was built for the European football championship of 2004, but this does not mean that the sight is only for football fanatics. Here you can see different sporting events year-round, so make sure to check if there is anything of interest during your visit. Cruise the Ria Formosa waterways in the lovely and tranquil blue boats available to rent. 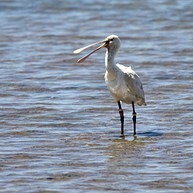 It is a great way to see the area and to indulge in a bit of bird-watching. You also have the option of stopping at one of the beautiful beaches and have a picnic lunch. If small fishing boats are not for you, maybe you would prefer a bigger sailing boats. 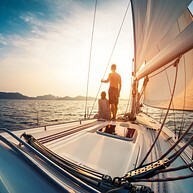 There are several companies offering day tours, and they even provide the possibility of attending a sailing school if you wish to be more active and learn how to handle yourself on the water. 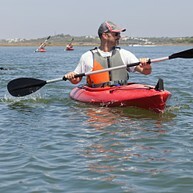 For many, kayaking constitutes one of the highlights of their trip to Faro. Admire the flocks of beautiful flamingos and the stunning views over the Atlantic Ocean as you make your way over the gentle waves. There are numerous places where you can rent kayaks along the coast. Push your limits at Parque Aventura, an adventure park located ten minutes walking from Oura Beach. Transfer yourself from tree to tree with zip lines and rope bridges and choose between different levels of height and difficulty. This is fun for all ages. 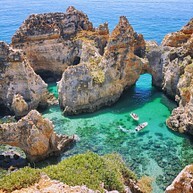 About a one-hour drive from Faro lies Ponta da Piedade, with its unique rock formations and grottos. The water here is crystal clear and makes for the perfect place to watch the sunset. There are boat tours for those who wish to see the caves and cliffs from the water. Praia Da Rocha, located 70 km from Faro Airport, is a lively beach town and provides its guests with sun beds, a range of activities, small shops, cafés, restaurants and hotels. The stunning coastline and the beautiful sandy beaches make it a perfect place for a day-trip or an overnight stay. Golf is a popular sport in the area of Algarve, and the beautiful surroundings are the perfect backdrop for a memorable round of golf. Boasting an impressive number, almost 40 different golf courses, there is something for players of every level and preference. 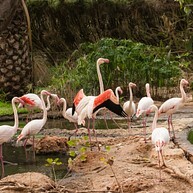 Parque Zoológico de Lagos is fun for the whole family, boasting hosts of monkeys, birds and other beautiful animals. There is even an area where you actually can meet some of the animals and interact with them. Additionally, at the snack bar you can enjoy a light lunch or a refreshing drink.